The Higher Nature Pets Balance Probio is a blend of 2 strains of friendly bacteria to help keep your pet’s gut healthy. Ideal digestive support for cats and dogs, this gentle formula can be taken on a long term basis. An easy dose powder, just mix with meals. Rice bran, lactobacillus acidophilus (bulking agent: inulin); bacillus coagulans (Lactospore). Take once a day, sprinkle over or mix into food. For fussy eaters can be mixed with your pet’s favourite treat. Take when needed. Can also be taken on a long term basis. Cats & very small dogs up to 5kg: ½ tsp per day. 90 servings. Small dogs 6-15kg: ½ tsp per day. 90 servings. Medium dogs 16-30kg: 1 tsp per day. 45 servings. Large dogs 31-45kg: 1½ tsp per day. 30 servings. Very large dogs over 45kg: 1½ tsp per day. 30 servings. A complementary pet food for dogs and cats - give only as a supplement to the normal diet. Suitable for all cat and dog breeds. 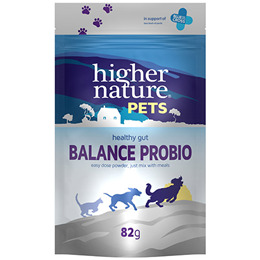 Below are reviews of Higher Nature Pets Balance Probio - Healthy Gut - 82g by bodykind customers. If you have tried this product we'd love to hear what you think so please leave a review. This works well for our greyhound who has inflammatory bowel disease.